The silky effects of water can add a touch of magic to a photograph. 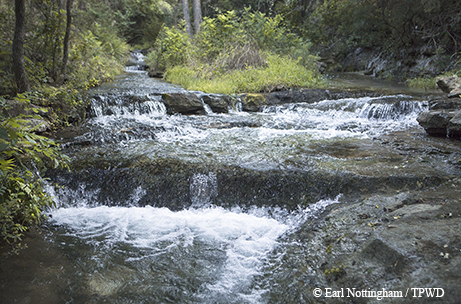 Somehow, the idea of Texas having an abundance of verdant, fern-framed creeks and waterfalls seems almost foreign. However, with the recent higher-than-normal rains, runoff has filled tributaries, regenerated springs, and raised creeks and rivers to full and sometimes overflowing levels. The abundance has caused headaches for many people but also has presented scenic possibilities for outdoor photographers. In fact, water in almost any form can make a landscape photograph even better. Basically, there are two approaches to photographing moving water. Either shoot it very fast — or very slow. Shooting at very fast shutter speeds (1/500th second or faster) stops most motion and maximizes the clarity and perception of raw power by freezing the motion of each water droplet. Conversely, shooting at very slow shutter speeds gives us that “silky” artistic quality often seen on calendars. It’s that silky (or laminar) effect that many photographers prefer, but it’s often one of the most elusive to capture. The secret to getting flowing water to render as a silky effect is to use a slower shutter speed than you would normally use on an outdoor photo. This typically means manually setting the exposure to shoot at shutter speeds of around one-half second to two seconds — or slower, depending on the speed of the flow. These slower speeds mean that a tripod is an absolute must to eliminate any camera movement. An electronic or physical cable release is also helpful to minimize any vibration from touching the camera. Alternately, you can set the camera’s shutter delay for a couple of seconds, which will allow you to hit the shutter button and step away from the camera. If you prefer using the camera’s automatic settings, you can choose the shutter speed priority setting, marked “S” on some cameras and “Tv” on others. With these settings, the camera will choose the appropriate aperture to achieve the correct exposure with the shutter speed you have selected. Shooting with a fast shutter speed stops the motion of the water, freezing each drop. Shooting with a slow shutter speed gives the water a silky, flowing quality. However, because of the very slow exposure, there is a point where the lens aperture cannot close down enough to balance the exposure, and this runs the risk of an overexposed image. Many cameras will give you some type of flashing overexposure warning. Setting your camera at its lowest ISO will also help lower the exposure sensitivity. A screw-in polarizing filter becomes useful here by cutting down on the amount of light entering the camera by approximately two f-stops. There are neutral density filters that cut down on light even more. One filter even cuts light by 10 f-stops, which can give you an exposure time of several minutes, resulting in some extremely interesting possibilities. Another consideration in capturing the beauty of water’s flowing and swirling patterns is shooting in lighting that best captures the nuances of the delicate tonal highlights and colored reflections on the water’s surface. Usually this means shooting in the soft, non-contrasty light of an overcast day or later in the evening when the sun dips low, rendering the silky water flow with pastel colors reflected from the sky above or from surrounding vegetation. Be aware that it is very easy to overexpose flowing water and lose delicate highlight details, so be prepared to shoot a couple of slightly darker exposures to produce that one image that gives you the sense of being able to “feel” the water. Our friend the polarizing filter once again becomes useful with its ability to not only cut down on the amount of light entering the lens for those slow exposures but also to control the bright reflections from the water and add color to surrounding vegetation. Just rotate the filter to get the level of enhancement that looks good to your eye.